My first love will always be Kraft Singles oozing out from between two slices of Wonder Bread slathered in Country Crock margarine. But I eventually outgrew that grilled cheese, just as I outgrew the middle school desire to loiter near the entrance to the PacSun at the Cherry Creek Shopping Center staring at scruffy skater dudes. I am human though, so my weakness for buttery bread and melted cheese (and guys in Dickies) never actually went away. My palate has simply matured. 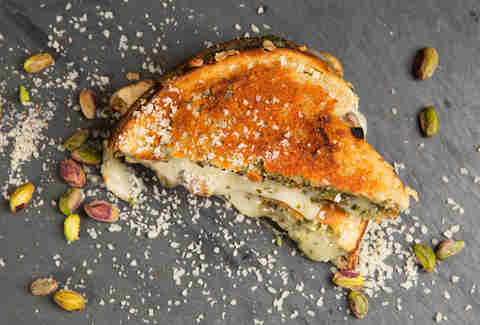 My grown-up grilled cheese is made with pungent Taleggio, herby pesto, and crunchy pistachios. I recommend pairing it with oversized Hurley shirts and Japan Airs. Heat a nonstick skillet over medium-low. Spread butter evenly on both sides of the bread slices. Place bread in skillet and toast until golden, about 2 minutes. Evenly sprinkle Parmesan on top of the slices and flip. 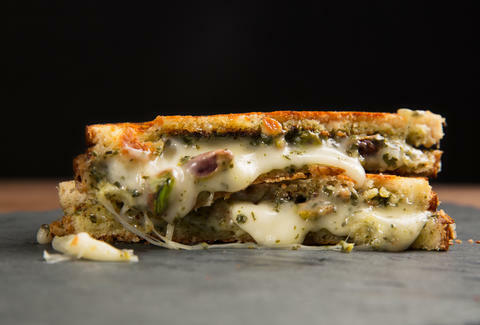 Spread pesto on both slices and top with Taleggio. 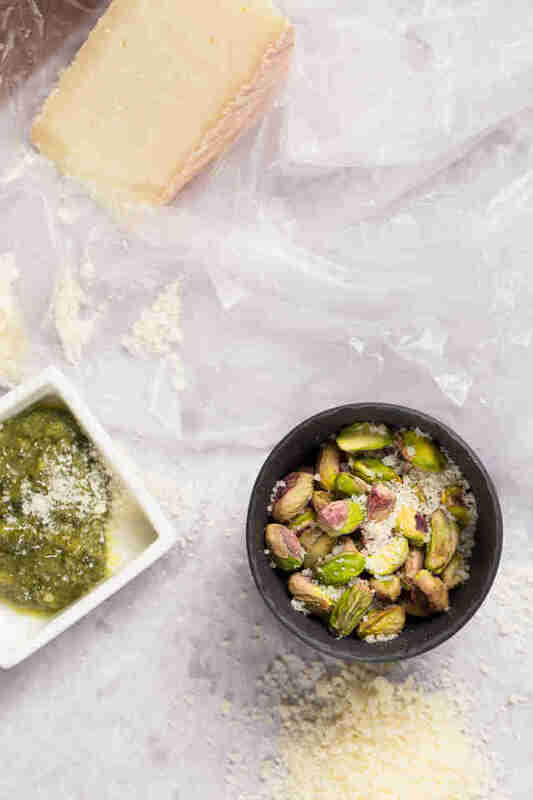 When cheese melts, turn off heat and sprinkle pistachios on one slice. Top it with the other slice with fillings facing in. Slice diagonally and put that monster away (into your belly).